In medieval weaponry, the breastplate is the front portion of plate armour covering the torso. It has been a military mainstay since ancient times and was usually made of leather, bronze or iron in antiquity. By around 1000 AD, solid plates had fallen out of use in Europe and knights of the period were wearing chain mail in the form of a hauberk over a padded tunic. Plates protecting the torso reappeared during the 13th century in the form of the cuirass or alternatively as plates directly attached to a knightly garment known as the surcoat. Around 1300 this developed into the Coat of Plates which continued to be in use for about a century. True breastplates reappear in Europe in 1340 first composed of wrought iron and later of steel.They were between 1 mm and 2.5 mm strong. In order to prevent the wearer from bring cut by their own armour, the design featured outward turned edges that also increased stiffness. In some cases, further strength was added by a ridge running down through the centre of the plate. These early breastplates only covered the upper torso with the lower torso not being protected by plate until the development of the fauld around 1400. Around 1450, the breastplate had expanded to cover the entire torso and could consist of one or two plates.Bullet-proof vests are the modern descendant of the breastplate. A live action role-playing game (LARP) is a form of role-playing game where the participants physically act out their characters' actions. The players pursue goals within a fictional setting represented by the real world while interacting with each other in character. The outcome of player actions may be mediated by game rules or determined by consensus among players. Event arrangers called gamemasters decide the setting and rules to be used and facilitate play. The first LARPs were run in the late 1970s, inspired by tabletop role-playing games and genre fiction. The activity spread internationally during the 1980s and has diversified into a wide variety of styles. Play may be very game-like or may be more concerned with dramatic or artistic expression. Events can also be designed to achieve educational or political goals. The fictional genres used vary greatly, from realistic modern or historical settings to fantastic or futuristic eras. Production values are sometimes minimal, but can involve elaborate venues and costumes. LARPs range in size from small private events lasting a few hours to large public events with thousands of players lasting for days. LARP has also been referred to as live role-playing (LRP), interactive literature, and free form role-playing. Some of these terms are still in common use; however, LARP has become the most commonly accepted term. It is sometimes written in lowercase, as larp. The live action in LARP is analogous to the term live action used in film and video to differentiate works with human actors from animation. Playing a LARP is often calledlarping, and one who does it is a larper. LARP does not have a single point of origin, but was invented independently by groups in North America, Europe, and Australia. These groups shared an experience with genre fiction or tabletop role-playing games, and a desire to physically experience such settings. In addition to tabletop role-playing, LARP is rooted in childhood games of make believe, play fighting, costume parties, roleplay simulations, Commedia dell'arte, improvisational theatre, psychodrama, military simulations, and historical reenactment groups such as the Society for Creative Anachronism. The earliest recorded LARP group is Dagorhir, which was founded in 1977 in the USA and focuses on fantasy battles. Soon after the release of the movie Logan's Run in 1976, rudimentary live role-playing games based on the movie were run at US science fiction conventions. In 1981, theInternational Fantasy Gaming Society (IFGS) started, with rules influenced by Dungeons & Dragons. IFGS was named after a fictional group in the 1981 novel Dream Park, which described futuristic LARPs. In 1982, the Society for Interactive Literature, a predecessor of the Live Action Roleplayers Association (LARPA), formed as the first recorded theatre-style LARP group in the US. Treasure Trap, formed in 1982 at Peckforton Castle, was the first recorded LARP game in the UK and influenced the fantasy LARPs that followed there. The first recorded LARP in Australia was run in 1983, using the science fiction Traveller setting. In 1993, White Wolf Publishing releasedMind's Eye Theatre, which is still played internationally and is probably the most commercially successful published LARP. The first German events were in about 1994, with fantasy LARP in particular growing quickly there, so that since 2001, two major German events have been run annually that have between 3000 and 7000 players each and attract players from around Europe. Today, LARP is a widespread activity internationally. Games with thousands of participants are run by for-profit companies, and a small industry exists to sell costume, armour and foam weapons intended primarily for LARP. The Greek astronomer Hipparchus (c. 190 – c. 120 BCE) credited Eratosthenes (276 –194 BCE) as the inventor of the armillary sphere. The name of this device comes ultimately from the Latin armilla (circle, bracelet), since it has a skeleton made of graduated metal circles linking the poles and representing the equator, the ecliptic, meridians and parallels. Usually a ball representing the Earth or, later, the Sun is placed in its center. It is used to demonstrate the motion of the stars around the Earth. 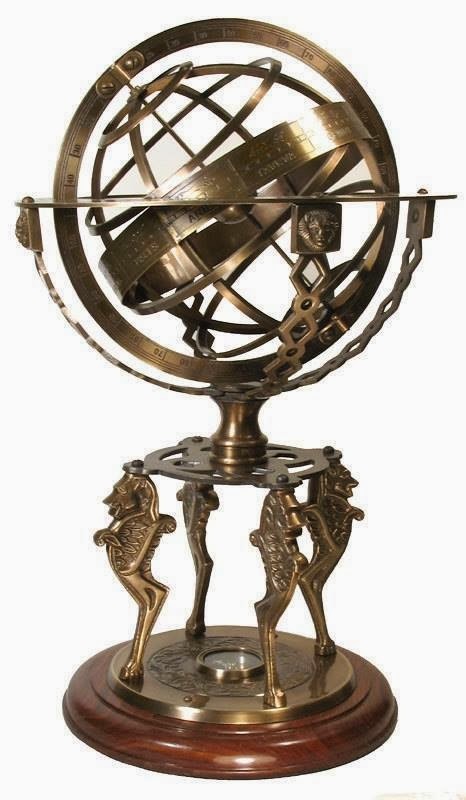 Before the advent of the European telescope in the 17th century, the armillary sphere was the prime instrument of all astronomers in determining celestial positions. 1. The equinoctial A, which is divided into 360 degrees (beginning at its intersection with the ecliptic in Aries) for showing the sun's right ascension in degrees; and also into 24 hours, for showing its right ascension in time. Throughout Chinese history, astronomers have created celestial globes (Chinese: 浑象) to assist the observation of the stars. 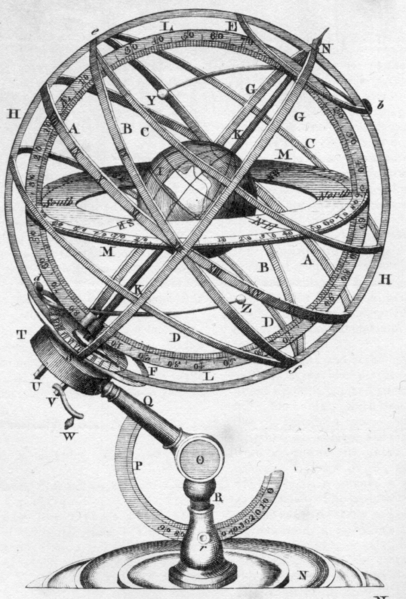 The Chinese also used the armillary sphere in aiding calendrical computations and calculations. Chinese ideas of astronomy and astronomical instruments became known in Korea as well, where further advancements were also made. According to Needham, the earliest development of the armillary sphere in China goes back to the astronomers Shi Shen and Gan De in the 4th century BCE, as they were equipped with a primitive single-ring armillary instrument. This would have allowed them to measure the north polar distance (declination) a measurement that gave the position in a xiu (right ascension). Needham's 4th century dating, however, is rejected by British sinologist Christopher Cullen who traces the beginnings of these devices to the 1st century BCE. A sundial is a device that tells the time of day by the position of the Sun. In common designs such as the horizontal sundial, the sun casts a shadow from its style onto a surface marked with lines indicating the hours of the day. The style is the time-telling edge of the gnomon, often a thin rod or a sharp, straight edge. As the sun moves across the sky, the shadow-edge aligns with different hour-lines. All sundials must be aligned with their styles parallel to the axis of the Earth's rotation to tell the correct time throughout the year. The style's angle from the horizontal will thus equal the sundial's geographical latitude. It is common for inexpensive mass-produced decorative sundials to have incorrect hour angles, which cannot be adjusted to tell correct time. There are different types of sundials. Some sundials use a shadow or the edge of a shadow while others use a line or spot of light to indicate the time. The shadow-casting object, known as a gnomon, may be a thin rod, or other object with a sharp tip or a straight edge. Sundials employ many types of gnomon. The gnomon may be fixed or moved according to the season. It may be oriented vertically, horizontally, aligned with the Earth's axis, or oriented in an altogether different direction determined by mathematics. With sundials using light to indicate time, a line of light may be formed by allowing the sun's rays through a thin slit or focusing them through a cylindrical lens. A spot of light may be formed by allowing the sun's rays to pass through a small hole or by reflecting them from a small circular mirror. Sundials also may use many types of surfaces to receive the light or shadow. Planes are the most common surface, but partial spheres,cylinders, cones and other shapes have been used for greater accuracy or beauty. Sundials differ in their portability and their need for orientation. 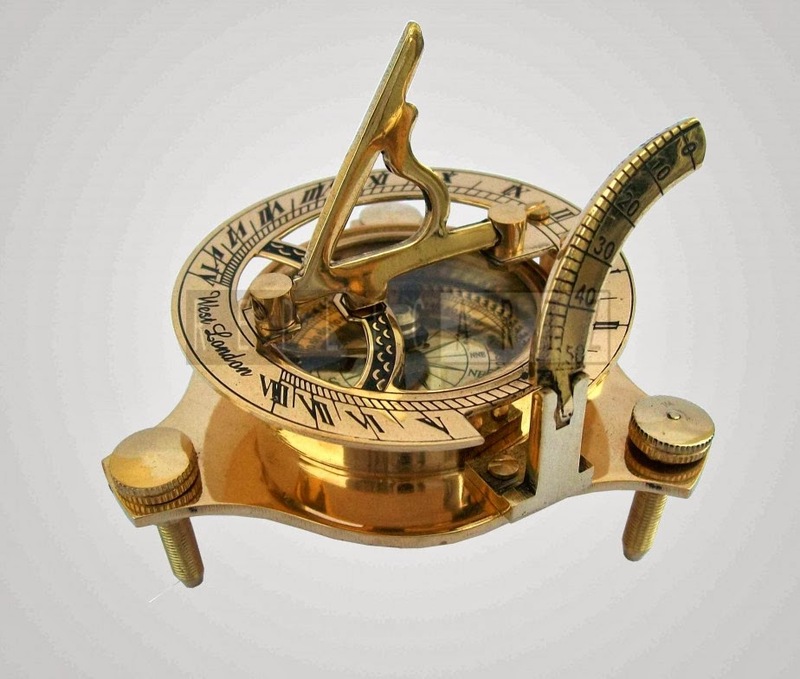 The installation of many dials requires knowing the local latitude, the precise vertical direction (e.g., by a level or plumb-bob), and the direction to true North. Portable dials are self-aligning; for example, it may have two dials that operate on different principles, such as a horizontal and analemmatic dial, mounted together on one plate. In these designs, their times agree only when the plate is aligned properly.